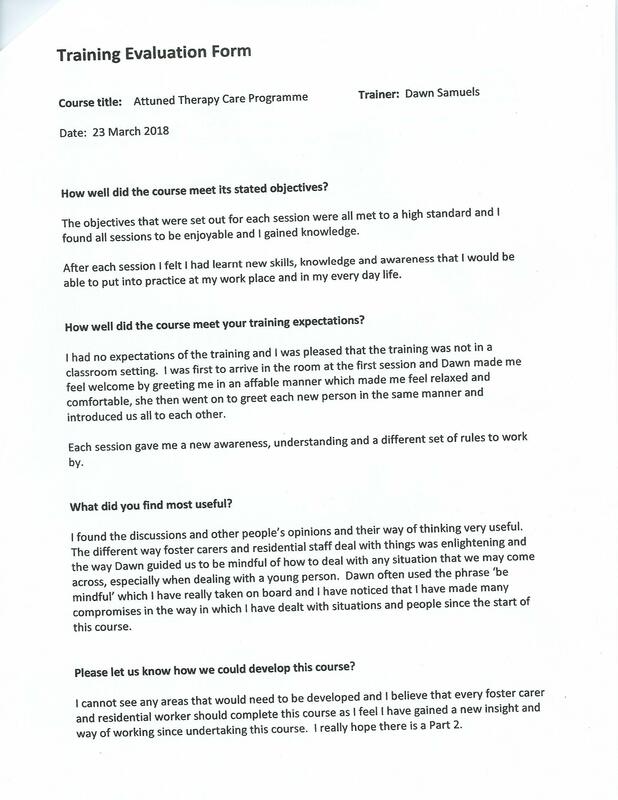 Attuned Therapeutic Care is a comprehensive therapeutic training programme developed by Simply Fostering Consultancy, using our extensive experience, knowledge and understanding combined with Dyadic Development Practice (DDP) and PACE interventions and models of care. Attuned Therapeutic Care (ATC) is a model of therapeutic intervention which is an experiential and interactive approach of training for SW’s, SSW’s, Foster Carers and support workers. It takes into consideration the therapeutic needs of children and young people who are looked after and have suffered trauma and insecure attachments. DDP is an intervention model developed by Dan Hughes, Clinical Psychologist from Pennsylvania U.S.A. It is a family based and is focused on facilitating the child’s readiness and ability to establish a secure attachment with his/her caregivers. 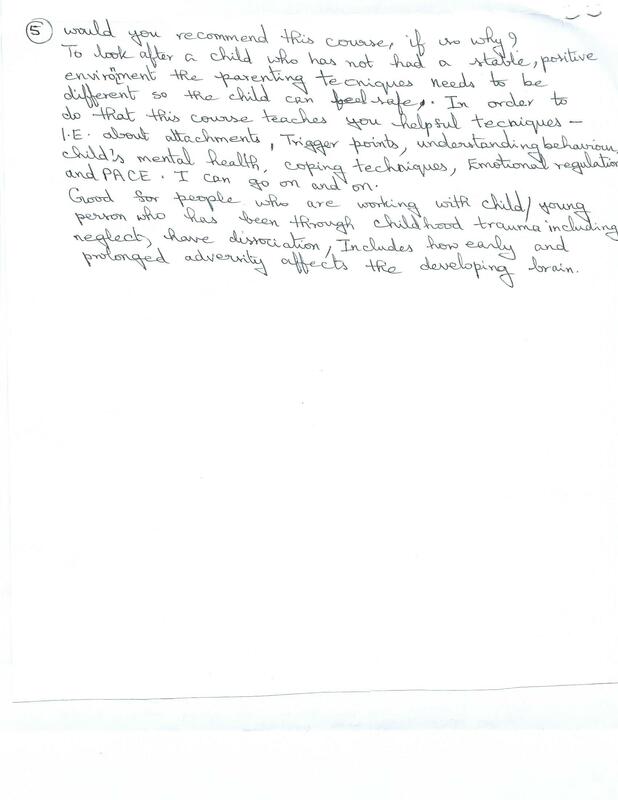 Recognises the vital role which foster carerplay in the recovery of traumatised and attachment resistant children. This is a 12 session programme which includes 2 reflective practice sessions. It is run over 24 weeks, one session a fort night each session is 5 hours. The programme will consist of group discussion; case examples, role play and video clips. All delegates will receive comprehensive hand out folders. There is flexibility with the sessions and there is scope for adaptation to meet the training needs of the delegates. Stability of placements/Relationships This is a difficult question to answer because working in a home I obviously work with a huge number of other people who can also influence stability. 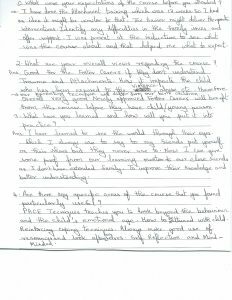 However, I have consciously been using elements of PACE with one of our female residents in particular – which seems to have had an impact at least within our relationship. Self-Awareness This has been a good space to take some time out and re think about my own behaviours and how they impact on others, to re visit and strengthen my knowledge around attachment theory and to hear from other as to how they may have handled differing situations. Mixed Course The approach to this course needs to be widened across the service if it is to have a strengthened impact. It is useful for just foster carers and residential staff to have? – yes probably. 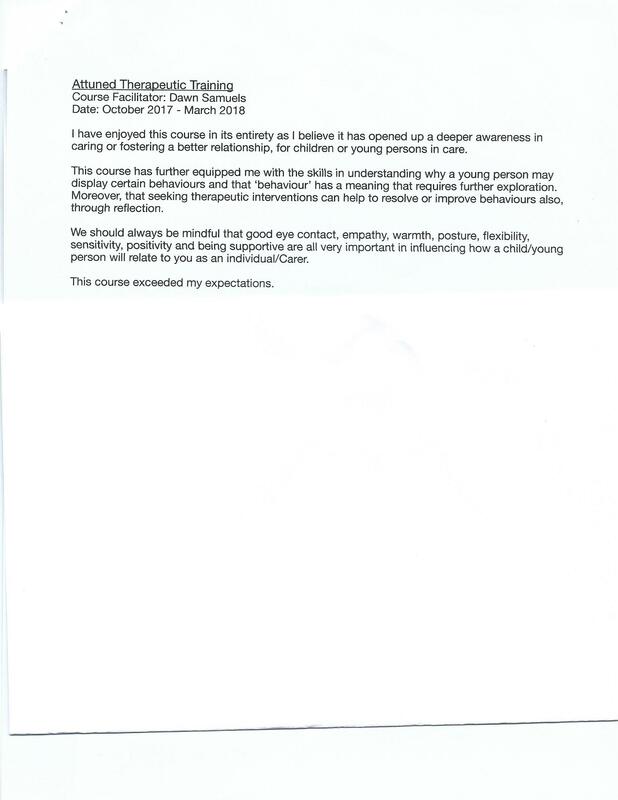 However I personally think it is important that supervising social workers have an understanding about what their foster carers will be trying to do – and how they will be trying to manage behaviours. 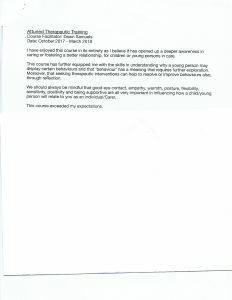 I also think (and I have no idea of how supervision with foster carers is currently conducted) that supervision with foster carers will need to be reflective and nurturing (based on PACE) – to help carers to continue to explore their feelings and to grow as people – therefore impacting on the kids in Barnet. 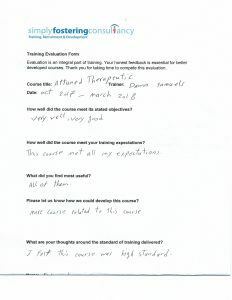 Feedback Over all I think this is a very good course. There were some area’s that I would like to have explored further (for my specific team – as I know the weaknesses and strengths of the team – self reflection and being punitive with sanctions/picking your battles) but as a general broad approach it was good. 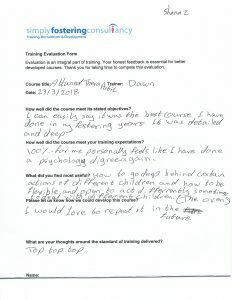 I would like to see all our foster carers/residential staff/supervising social workers trained in attuned therapy/PACE as I think gave participants strategies and tools they can use when working with (particularly) challenging behaviour and it gave people an insight into they own reactions and behaviours. I have absolutely loved this course because it has allowed me to continue and cement the learning I had already started on my own. Since looking after a young person with complex emotional needs I had already started reading about mindfulness and how to care therapeutically. This course has most definitely helped me to understand better what I had already started to learn but most importantly apply it better to the young people I am currently looking after. The course has helped with my current placements and with the contact I have with the young person mentioned above. I am much calmer in challenging situations with one of my placements. 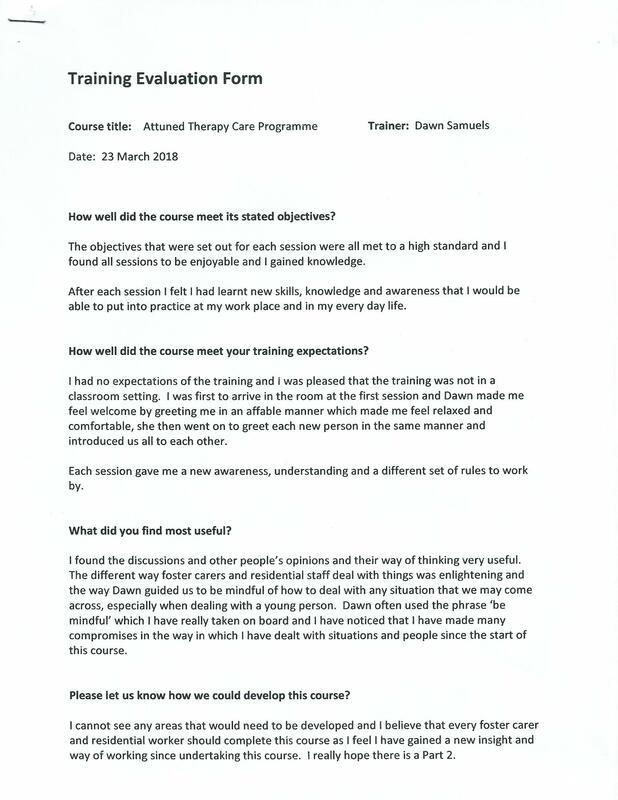 The course has encouraged me to go back and look at her behaviour and rather than seeing her as someone who is compliant and seemingly fairly easy to look after I am addressing this with looking at her avoidant attachment and being more therapeutically engaging with her. In terms of managing the behaviour of the young people I look after this is much easier and has better outcomes because I am now mindful of how they are thinking rather than being annoyed or cross with them. Again, in this light, the course has made me look at my own self-awareness and look at how I am feeling and how that might impact on the young person . My parenting of the young people is definitely more concrete and more consistent than it was before I started the course. I have had lots of opportunities to put in practice what I have learnt on the course and this is evident when you meet the young people I currently look after and the young person I still support but does not live with me. Dawn has been an amazing teacher and I have loved the way she runs the course with professionalism and humour. I will miss these sessions. This course has been an enormous help in that it reinforces the need to adapt the PACE approach into my practice, being playful is a tremendous tool that I didn’t utilise as effectively as I could have done, and more recently since my latest placements, I now find myself swimming with the children rather than watching from the bench, this has brought me closer to the children in building and strengthening our relationship, and making the children feel a sense of belonging, feeling valued, loved and cared for, the word that resonated with me is “CLOSER” remembering Dawn reminding us to keep them close. As with my 10 year old who was achieving 3 spellings per week having kept him under my arms while cooking and doing chores he achieved 9 spellings last week and is on target for 10 this week. Raising the young person’s attainment, value and confidence. Moreover, it also helped me to analyse the lack of playfulness in my own childhood and my development. Another aspect of the course which I found exceptionally useful is knowing how to and when to respond to the YP when they are presenting or having a meltdown, and to be aware not to be drawn in to a “TIMEHOLE”, which may have nothing to do with the current situation as the young person might be using the opportunity to offload while releasing hence, reducing the level of pain from their system and to be aware of triggers which requires careful monitoring, observation and listening. Finally, the course has taught me to be mind minded and in tune with my young person, this has helped me this week when I could not find my young person, but predicted that because she is aware of my routine that she knows where I would be at a certain time, however, it was a joy for both of us when I arrived and she was waiting there for me, this confirms to me that we have good connections and engagement with each other and are mindful of each other’s feelings/inner experience given the present reality. 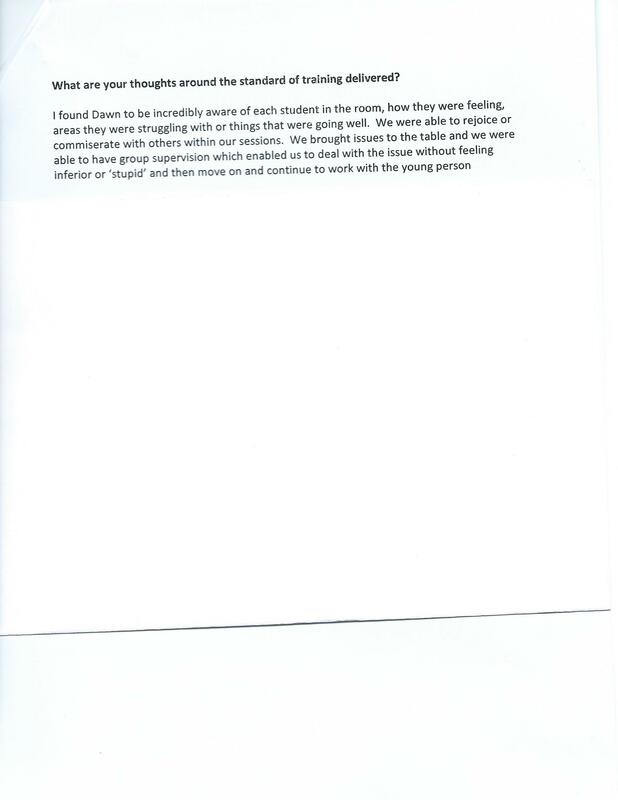 This was a wonderful experience attending this course as it also made me more aware of the importance of listening to children and young people, praising children and young people and rewarding and respecting the younger generation, this has the utmost importance to me as I do not recall being made to feel appreciated, in fact I was taken for granted and accepted that I was just there. I now have a much better awareness of how this must feel for the young people that we care for. 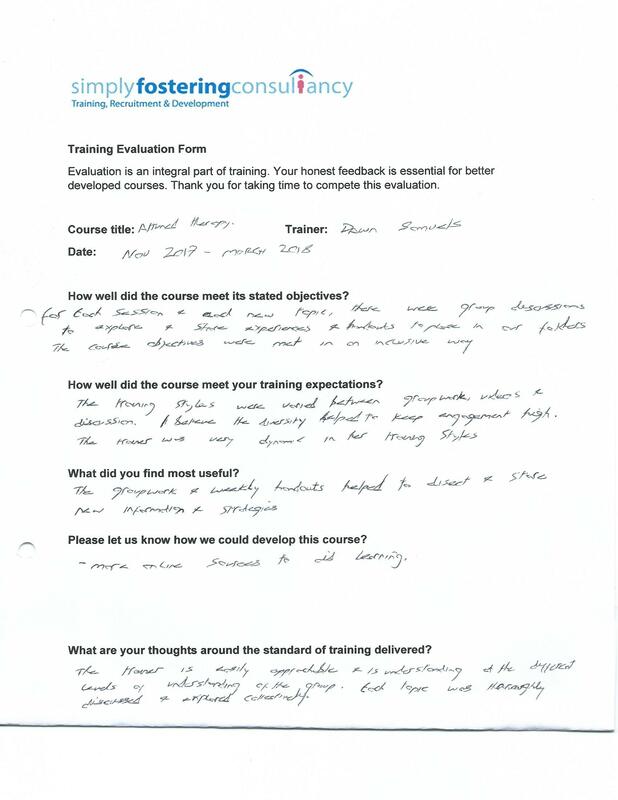 How has the course helped with relationships, behaviour management and self awareness? I have become more observant and curious, endeavouring to keep my YP closer to me to be more attuned without seeming nosey. This has helped with us feeling very comfortable with each other and communication is flowing. She wrote a blog recently in which she describes me as “a fantastic carer” which, obviously, touched me a lot. I have confidence and trust my YP and therefore allow her quite a bit of freedom. However, I do ensure that boundaries are kept in respect of coming home times, homework, hygiene, chores attending to personal responsibilities etc. I make a point of knowing her friends and if she is out at weekends with friends we keep in regular touch with texting. I consider this “keeping her close”. She responds well to this. 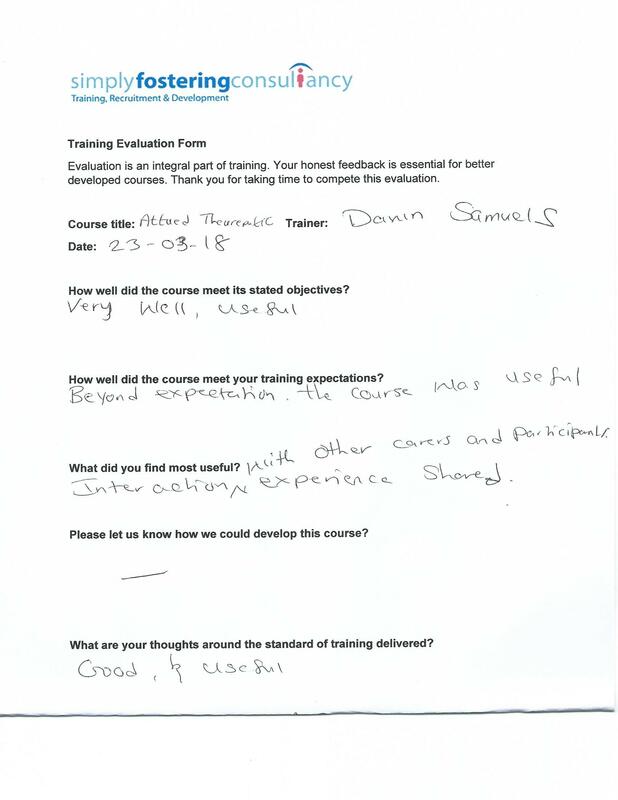 The course has definitely made me more attuned to myself, reflecting on how I manage situations and thinking about how I am handling the placement and what I can do to improve it, what could I be missing, and apply strategies discussed. 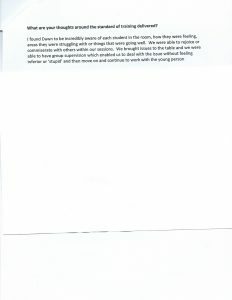 In the past I have had much more difficult placements and feel this course would have been very useful to me in terms of perhaps having more empathy and attunement, using playfulness and jokes maybe (it’s easy to be playful with my angelic YP but a different story with a difficult YP) trying to tap into the causes behind the challenging behaviour, trying to go ‘deeper’ into the YP and being careful not to take difficult behaviour, rudeness, verbal attacks as personal. I have moved on since the start of the course. The PACE model is an important template. I have gained immensely in terms of examining, thinking and considering more deeply about what I am actually doing and how my own growing up experiences influences my fostering skills. Also listening to other people’s experience and management skills, in fostering and in their homes has been a valuable education. 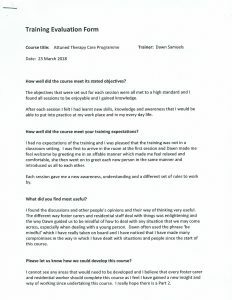 This course has helped to highlight and expand my awareness of the therapeutic needs and behaviour of the young people in care and to put into context antecedent behaviour and the consequences of that behaviour. I have been empowered with a greater understanding of the origins of behaviour and the various therapeutic interventions that can assist me in providing more appropriate resolutions. 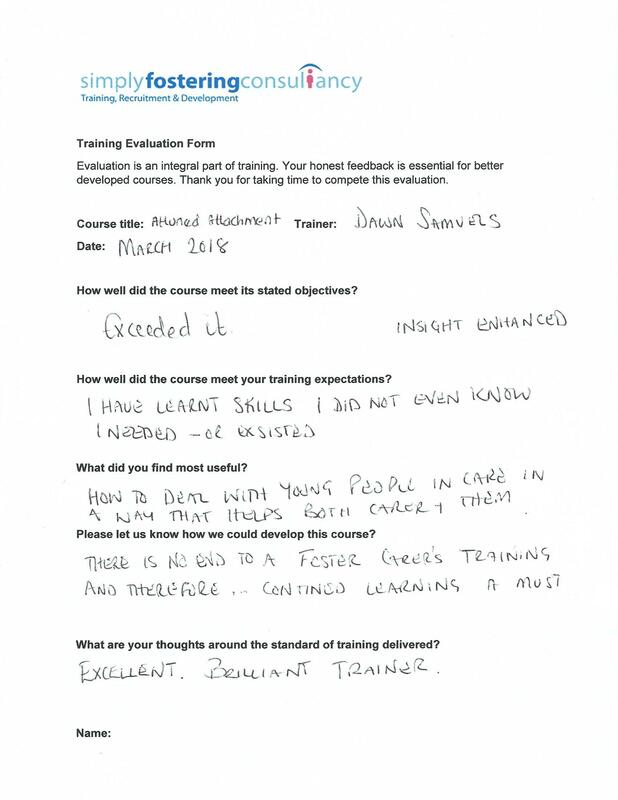 The course helped to expand my thinking and the openness of discussions and group participation encouraged the practical aspects of caring. Additionally the course was well facilitated as she had a great depth of knowledge which was well articulated. I will recommend this course to all Carer’s as I have realised a very positive impact in my approach to delivering care. The course has helped with me having a better understanding of myself and my own attachment styles taking time out finding some respite and having relaxation ie listening to music, yoga, walking etc because if I’m not ok then children in my care are not ok. Parenting can be sometimes hijacked by stress. Relationships :Being calm and non-reactive and waiting until another time. As a child YP knows how to push buttons and reacting reinforces the negatives of self- image. 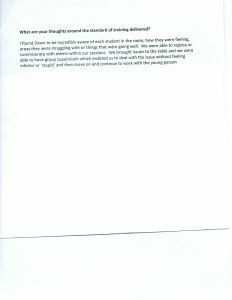 Behaviour Management: I always listen to the YP not allowing my own prejudices and values to get in the way of my understanding – using sentences like “what I heard you say is ………..or “ I am so sad you feel this way”…..and focus on the positive behaviours. I am more attuned with my young people and am keeping very close maintaining a therapeutic alliance using more therapeutic attuned care. 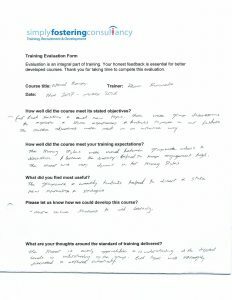 I have thoroughly enjoyed this course, it has enabled me to recognise the strategies that I am currently using and add a name to them. It has also helped me to be confident, to reinforce patterns of behaviours and actions that help to encourage stability and manage emotions. I believe that this course would be integral to all foster carers and social workers in aiding towards a much more effective and efficient way of caring, safeguarding and maintaining healthy and open relationships. I feel this course would be a perfect follow on from the Attachments course. 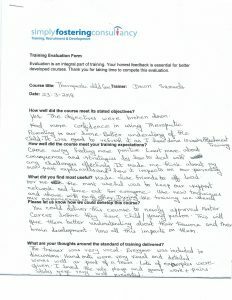 Schools would also benefit from maybe a shortened version of this course to help them to understand and encourage them to use some of the techniques and practices that are used to help young people affected by trauma, conditioning and attachments. 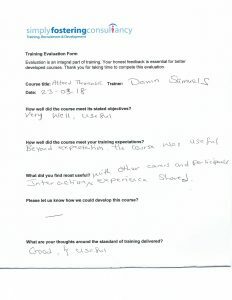 Thank you Dawn such an engaging trainers and lovely person. This course has helped me to reflect on my practice and change the way I parent/care for my child. It is very easy to become complacent when fostering a child long-term. 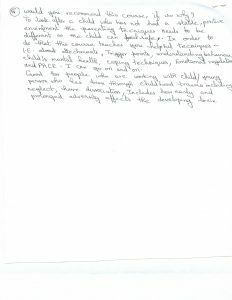 I learnt so much about why m child behaves in certain ways. Most importantly I learnt how to manage and reflect my practice/care. 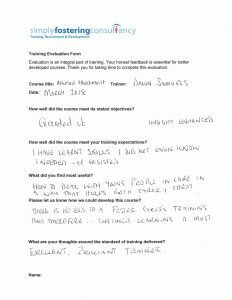 I have experienced some challenging behaviours recently and this course has helped me to listen and react in a different manner that has had a positive outcome. I genuinely had concern over the future stability of my placement but feel confident to work better with the child in my care. Attending this course has been a pleasure. 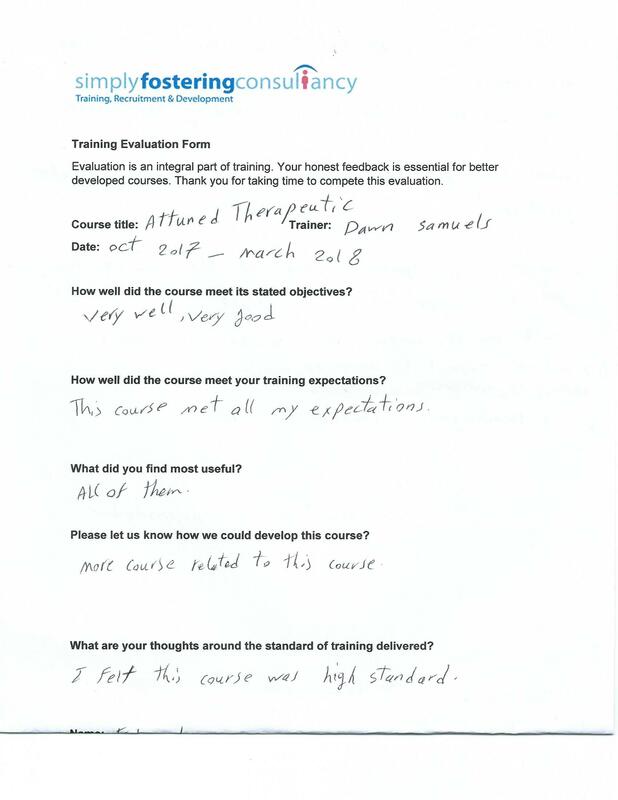 The trainer has fantastic people skills and was able to keep me focused and committed to attending the whole course with exception of 2 sessions. Thank you Dawn for making the course informative and exciting. I have been able to learn from others in the group and aspire to be like some of the carers in the group that shared a wealth of experience. I have to say thank you to Dawn and the organisers of the Attuned Training. It has been amazing, I am fully informed and inspired. I enjoyed the training a lot better than I anticipated. Dawn’s method of delivery is so easy to receive it. 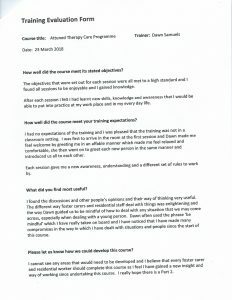 I wish the rest or more of the care staff workforce will also benefit from the training even it is compressed to fewer sessions. The impact is definitely immediately applicable. Acceptance – creating psychological security. Curiosity – always being curious. Empathy – is the outcome of our curiosity and acceptance as we know ourselves better. Self Awareness I always try to be sensitive and emotionally responsive to children’s needs and knowing when to let them struggle and work through challenges to build their own resilience. I feel that I hold firm boundaries and teach good quality independence and skills and always try to maintain optimum positivity with my child. Dawn the course facilitator really brought the course together with motivation, understanding and bonding the group together . It was an amazing course. 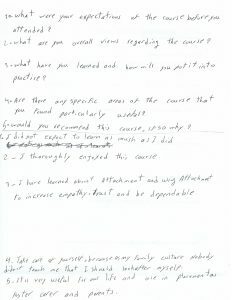 I was asked by my supervising social worker if I would be interested in attending this course. 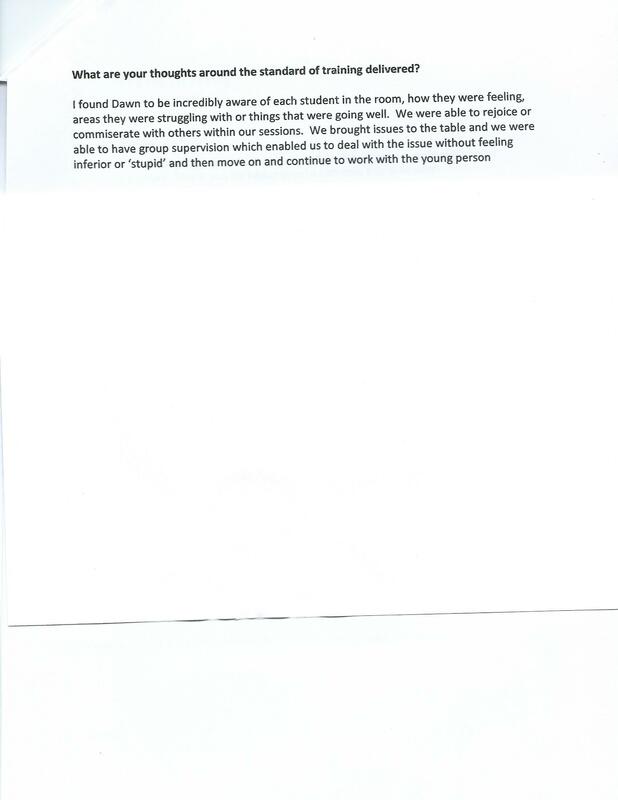 As it turned out my supervising social worker was also attending the course. I accepted the offer as I enjoy the opportunity to learn new things and although I didn’t have a placement at the time. I knew my long term place was to return to fostering . This course has offered me so much more than just learning. It has given me the opportunity to get to know other carers, listen and learn from their experiences and comprehend the complexities fostering can bring. I have also had the pleasure of meeting the managers of the children’s homes and listened to how they work with teenagers and hear of the strengths and difficulties they encounter with the children placed in their care. 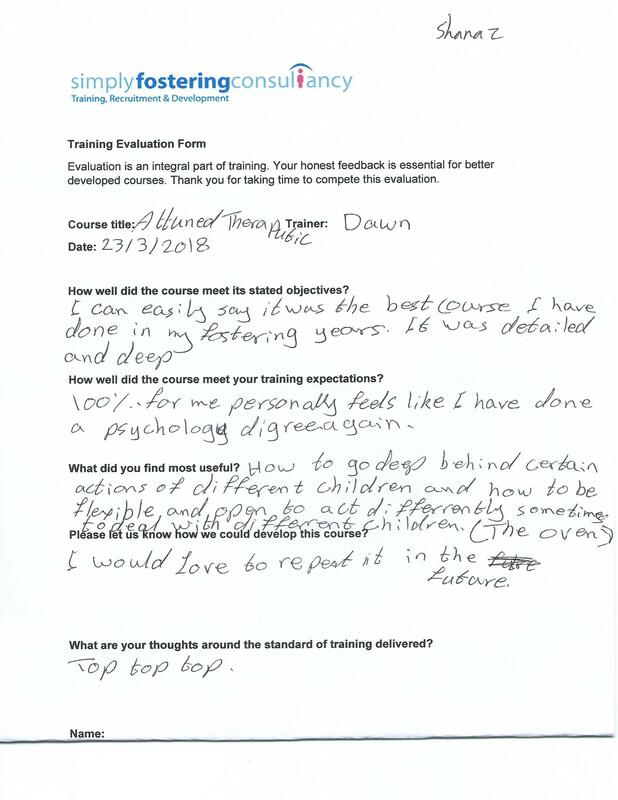 Listening to them has enabled me to build the confidence to consider older children and with the new learning brought about by this course, I believe I am able to be more understanding towards some of the challenges the children face and the joy that they can bring. Some of the strategies I have learnt over the last six months have been put into practise with my birth children and grandchildren and I have done a considerable amount of reflection on my previous placements. I have explored my own ‘attachment’ and upbringing and considered how this affects me and how I present to others. I believe I am now more mindful on how I can apply myself to support children placed in my care. By gaining a better understanding of myself, I believe the children placed in my care will benefit greatly in the way I approach the placements in the future. 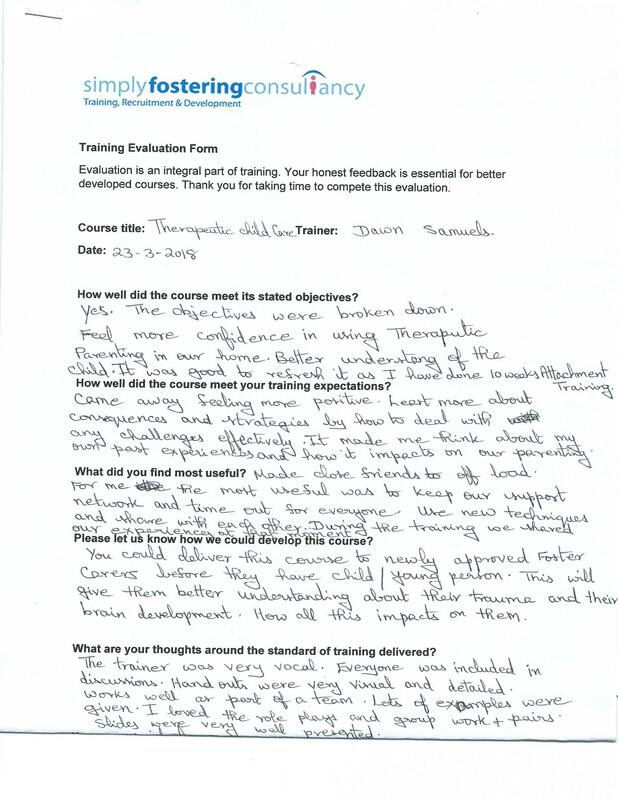 This course has also enabled me to see beyond the presenting behaviour of a child in my care. Being able to understand where some behaviour comes from has given me the capacity to become more insightful and compassionate towards the child’s needs. By applying ‘PACE’ I believe this will support me to help the child work through some of their emotional trauma, build a rapport with me and support them to build trust. I would recommend this course for anybody who is working directly with children or supporting other people who are working with children.